Posted March 20, 2019 by greendog & filed under diet and health, Dog Nutrition, Heart Health, pet food ingredients, prescription pet foods, specific ingredients, Useful. You may have heard something online or from your vet about the issue of dogs eating grain free foods sometimes showing low levels of taurine in their bloodwork. Since then, we’ve had a number of customers that come saying their vet told them to switch to a food containing grains. One local vet in our area just sent out an email about Heart Disease and grain free foods, and also advocating for the use of “Meat By-Products” in pet foods, and we’d like to address both of these topics to help you learn more and make educated decisions. The truth is, all processed dry pet food diets are compromised nutritionally due to high-heat, high-pressure extrusion and the need for starchy carbs to bind them and make those little crunchy nuggets. Critical amino acids like taurine that are found in muscle meats and organs are fragile and very heat sensitive, and so become damaged by processing. It’s true that another variable that might exacerbate these diet related heart problems could very well be the overuse of legumes in dog foods. Some brands use a lot of them because they contain plant proteins that are less expensive than meat proteins, but plant proteins don’t contain those vital amino acids. Large quantities of peas may very well be blocking absorption of those important amino acids found in meat that do vital jobs in your dog’s body like support his heart function. Please read more in this important article – we’ve tried hard to distill the facts and offer suggestions for how to avoid trouble. One thing that frustrates us is that many traditional vets work closely with brands like Purina and Hills, who are companies eager to use this opportunity to switch nervous consumers back to their formulas that contain corn, wheat, and soy. Some of these well-intentioned vets are simply advising customers to switch to any food containing grains. Please note that foods made with grains also are using plant proteins to save the company money by taking the place of more species appropriate proteins from meat, and these plant proteins also do not contain those valuable amino acids like taurine, just like in grain free foods. Both corn and wheat are high carb and high glycemic ingredients and can also cause food sensitivities/allergic reactions in dogs. We often see dogs with new troubles come to us after having been on a diet like this, and we are able to reverse these new issues when we remove the foods that contain corn, wheat, and soy and switch to kibbles that have higher quality sources of meat proteins. More importantly, ingredients such as corn, wheat and soy are likely to contain contaminates that don’t cook out. GMO crops are sprayed with large quantities of RoundUp (glyphosate), and corn is especially problematic as it almost certainly contains dangerous aflatoxins. These are dangerous grain molds, toxic to humans and animals, even in very small amounts. 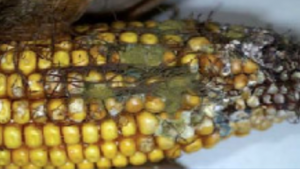 Our most recent stats from 2017 show that 88% of all corn tested nationally was contaminated with aflatoxins, and in some previous years (2012) it has been 100%. A testing agency stated:”With more than ten-years of experience monitoring the occurrence of mycotoxins in livestock feeds, BIOMIN has shown that co-occurrence of mycotoxins (the presence of more than one mycotoxin) is the rule and not the exception” The FDA allows mycotoxins to be at 20 ppb (parts per billion) in pet foods, however science shows that even small amounts of mycotoxins can be dangerous to pets. From the International Journal of Food Microbiology, Drs. Herman J. Boermans and Maxwell C.K. Leung published the report “Mycotoxins and the pet food industry: Toxicological evidence and risk assessment” in 2007. 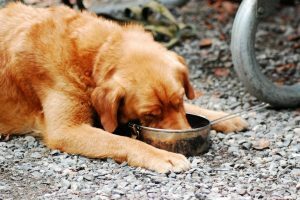 One of the biggest issues of concern discussed, is that existing studies of mycotoxin contamination in pet food overlook the day to day consumption of small amounts of mycotoxins; resulting in “chronic diseases such as liver and kidney fibrosis, infections resulting from immunosuppression and cancer.” In 2005 a Diamond Foods aflatoxin recall resulted in 100 dog deaths. 1)call the company and ask this question. If they won’t tell you, perhaps switch brands. 2) Look for a baked kibble (as opposed to extruded) as more of the amino acids survive baking intact. Stella and Chewy’s is one baked kibble we carry. One thing they said that we do take issue with is the statement that “Meat By-products” get a bad rap and are actually just contain good organ meats. Organ meats are desirable ingredients, and are far more expensive than “Meat By-products”. Good organ meats would be listed on the label as their own named ingredient, ie: “beef liver” or “beef hearts”, etc. and would be USDA inspected and passed for human consumption. When you look closely at FDA laws concerning pet food ingredients, “Meat By-products” are defined as rendered product that is legally allowed to be a mix of any species of animal, including animals that “died otherwise than by slaughter”. These include animals that died from disease, euthanized animals, condemned/spoiled meats, and roadkill. Rendering facilities are waste management facilities, with separate standards for handling and storing ingredients meant to be rendered. FDA states clearly that these ingredients are acceptable in pet foods. When looking at your ingredient list, it’s important that you see the species of animal mentioned with the proteins and the fat. ie: avoid “Animal Fat” and choose “Chicken Fat”. We love human quality organ meats for pets, and strongly advocate for their use to help supplement naturally occurring amino acids like taurine, cystein and methionine that support heart function, but we avoid By-products in pet foods, as even named ingredients such as “Chicken By-products” are not handled with the same safety or quality standards as USDA inspected and passed meats and organs. Final Thoughts: It’s true, in its recent update the FDA says that between Jan. 1, 2014 and Nov. 30, 2018, it’s received reports of 325 dogs and 10 cats diagnosed with DCM. Most were eating grain free kibble, but some were on kibble with grains, vegan diets, and some homemade diets. The figures include 74 dogs and two cats that have died. At the same time, as the FDA notes, diet-associated reports of DCM have affected a very small proportion of the estimated 77 million pet dogs in the country. “Tens of millions of dogs have been eating dog food without developing DCM” and “Based on the data collected and analyzed thus far, the agency believes that the potential association between diet and DCM is a complex scientific issue that may involve multiple factors,” the FDA said in the update on its investigation.